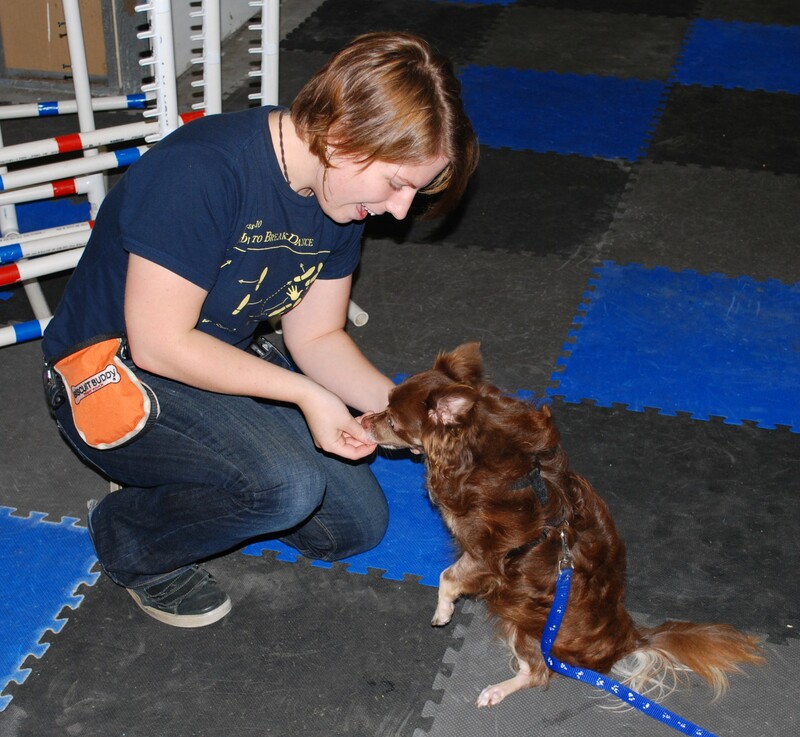 I brought my friend Dan with me to Life Skills at Madison Mutts on Tuesday, and the result was some pics of me teaching class. Usually Life Skills ends up being between two and 6 dogs, though I’ve also had classes of 1 and classes of 8, so it kinda just depends. It is a drop-in class after all. Anyway, Life Skills is essentially just really basic stuff. We go over Sit and Down and Stay and Leave It, etc, etc, etc. Generally, it gets tailored to whoever shows up. Since it is drop-in and people may only come for one or two weeks instead of 6 weeks like a standard obedience class would run, there’s no point in trying to keep a set schedule – at least not unless we start announcing what we’re teaching from week to week. So, this week we had three dogs. Here’s Spencer, a recent Madison Mutts Adoptee. He’s a super sweet, pretty smart dog. He just doesn’t know how to lie down and from what I hear his recall’s in need of some pretty serious revamping. So, what did we do in class? Well, downs and recalls, of course. Grissom- the cute terrier mix in the background – is great too, but since his recall with distractions (like food) needs a bit of work, it worked out well for him, too! 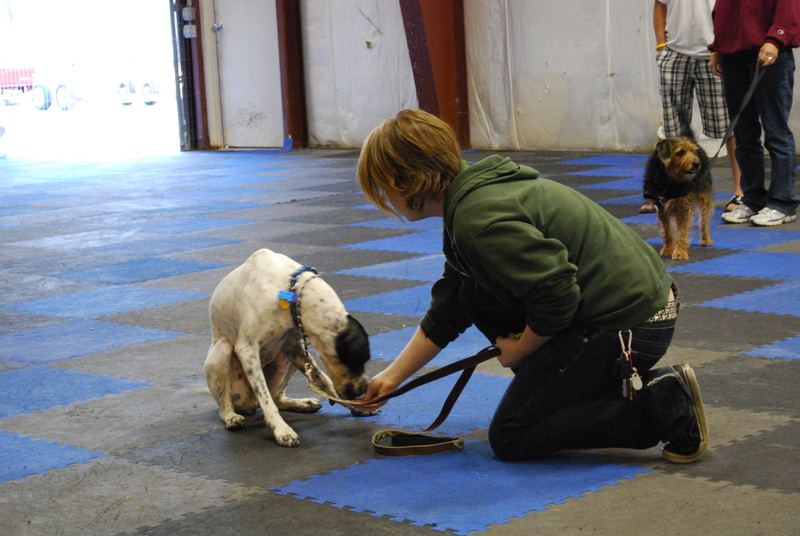 That’s really the only problem I have with the drop in class: sometimes the dog’s skill levels are so drastically different that I have trouble accommodating them all without one of them getting frustrated or bored- those classes end up having a lot of mini-private training sessions, which I actually like doing anyway. I’m slowly coming up with a vast array of ideas for classes that I can do. I’m actually thinking that one of these days I’ll start advertising the Life Skills class as something where each week we tackle a different problem behavior. Barking one week, digging the next, recall the next, etc. I think it’d be really useful, since a lot of the time people are just looking for help with one behavior and don’t want to deal with a 6 week class or guess at what they’re teaching that night in a drop-in class.